Sébastien Ogier took a significant advantage in the title decider Down Under over principal championship rival Thierry Neuville, who dropped almost 45sec in the final forest road speed test after locking-up at a chicane. Both title contenders struggled for grip at the head of the start order. The forecast overnight rain failed to materialise and they brushed aside a top-coating of loose gravel to leave a cleaner line and more traction for those behind. Neuville was seventh, three places and almost 10sec clear of Ogier, heading into the second pass through the 26.68km Sherwood test. His Hyundai i20’s left rear tyre punctured following a jump and shortly after he slid into a chicane and stalled the engine. The Belgian, three points adrift of Ogier in the standings, dropped to 10th. He faces the unenviable prospect of starting second on Saturday, on roads covered in thicker gravel than today. Ogier ended seventh in his Ford Fiesta. He was aided by M-Sport Ford team-mates Teemu Suninen and Elfyn Evans who deliberately slowed before the finish of the same stage to promote Ogier up the leaderboard and ensure a better start position tomorrow. “I pushed like crazy in the final stage, the conditions were worse than this morning. I was on the limit, I could not have done more,” said Frenchman Ogier. 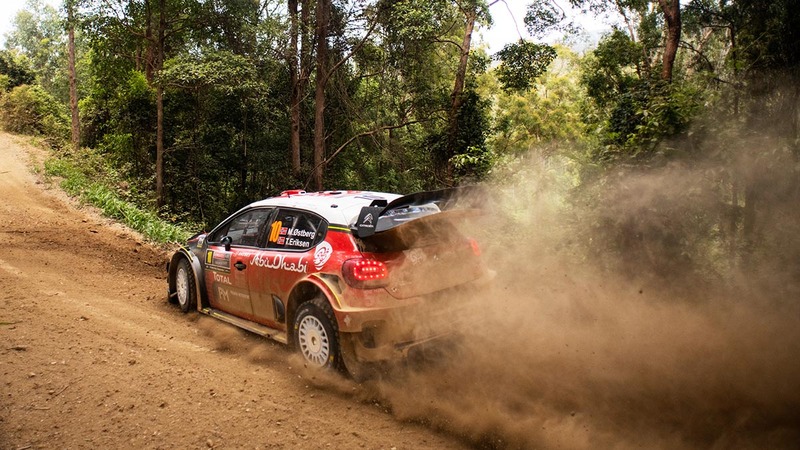 Mads Østberg, the lowest frontrunner in the start order, used his advantage to the full to head a Citroën C3 1-2. He took the lead in the first pass through Sherwood and ended 6.8sec clear of Craig Breen, who overcame brake problems. Jari-Matti Latvala was a further 1.9sec back in third. Latvala and team-mate Esapekka Lappi were tied at the top initially, but Lappi lost 20sec after his car’s engine took on water in a river crossing. The Finn ended sixth. Kiwi Hayden Paddon was 3.8sec behind in fourth in an i20, with Estonian Ott Tänak next up after an error-strewn day which almost ended early when a kicker launched his Yaris onto two wheels and into a bank. Tänak, the outsider in the title fight, was third but fell foul of the same watersplash as Lappi. The impact on entering the water tore the front aero from his car and affected its handling. Andreas Mikkelsen was the only major retirement. The Norwegian parked his i20 with suspected radiator damage after crashing into a ditch.